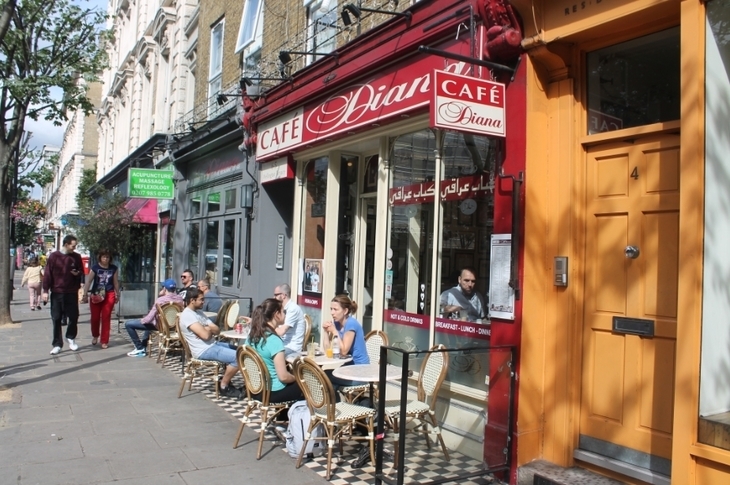 In July 2016, we called in for a coffee and a chat at Cafe Diana in west London. "Sometimes people cry. It's been 20 years." 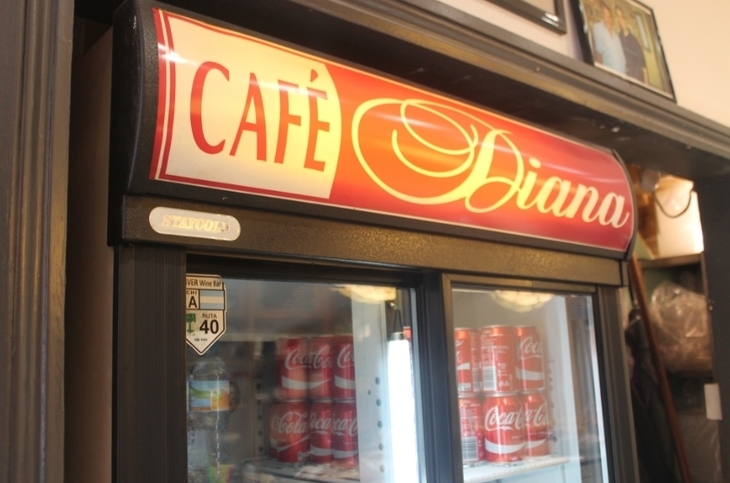 Fouad has worked at Cafe Diana for 25 years. "I've seen Harry one time come to the door and he left. Just come to the doorway, look at the pictures and go." 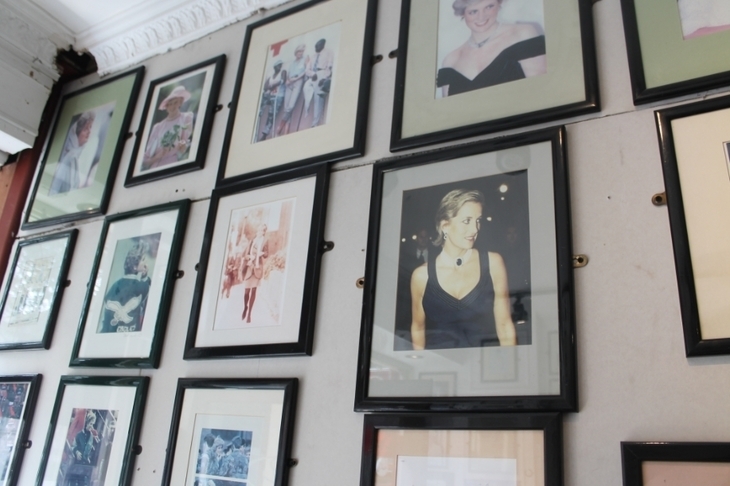 It was a couple of years after the death of Princess Diana, Fouad tells us, and a teenage Prince Harry was staring into the window of Cafe Diana — a small Bayswater establishment named after his late mum, its walls plastered with framed photos of her, press cuttings, letters from her private secretary. Had the young prince stumbled upon this cafe by serendipity? Was he upset that someone was cashing in on Diana's name? Not at all. He was probably just looking for the table where he used to sit, when he came here for breakfast with his mum. It was a regular haunt of hers. 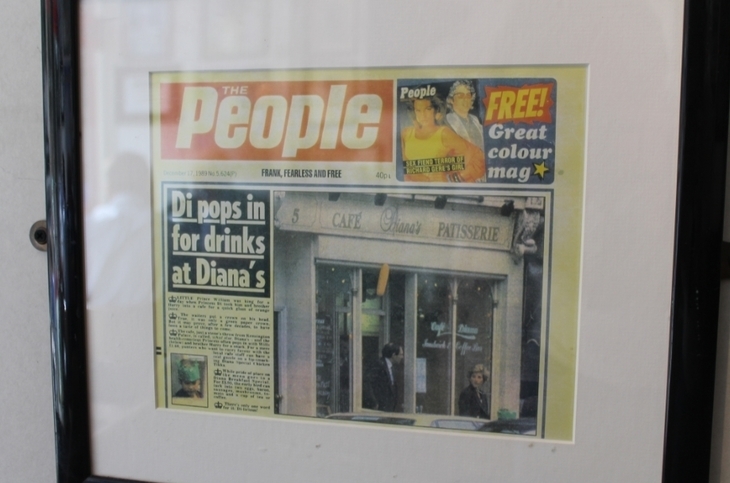 "He was looking for a name, so then he sees Diana coming out from the gate [across the road at Kensington Gardens] taking her kids to school or going out, and he said: 'Why not... the Diana Cafe.'" "Three, four days later Princess Diana was in," says Fouad. Already, you start to understand this is not your average themed cafe. It might be on a street thronging with open top tour buses, the odd shop selling Prince William party masks. But it's been going for 28 years. 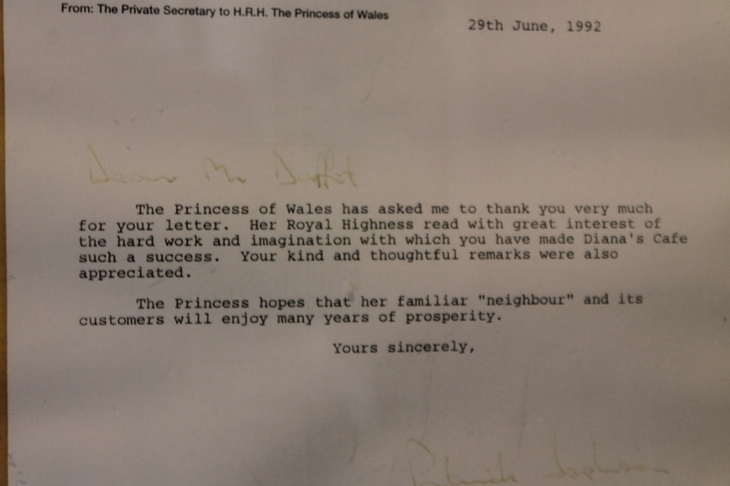 And that first visit from Diana was the first of many. "She started coming more often," says Fouad, "bringing the kids here sometimes for breakfast, and then every time going out, in — waving. "The kids used to take breakfast, like English breakfast. Herself, she used to have cappuccino, cake, some croissants, something like this. "But she sometimes had English breakfast too." You might even say Princess Diana started her own reliquary. When the owner asked Diana for a picture of herself, she happily obliged, giving him a sultry black and white shot, signed in gold at the bottom. Fouad also points out another photo where he's posing in the cafe with Diana, Abdul and other members of staff. Diana had set off yet another trend. "I remember once she came here and she was looking around, and she seen some pictures on the wall, and she was like laughing. It was a surprise for her — more pictures!" says Fouad. "Then before she passed away, I think one month or something, she pass by, she have a cappuccino, and then she said "I'll come back later..."
"..and then she go and never come back." It was then, on 31 August 1997, that the cafe's purpose changed overnight from a cheeky nod to a famous neighbour, to a shrine that would last decades longer than any of the flowers left outside Buckingham Palace. "Once she passed away, we closed for a couple of days. And then we started business again," says Fouad. 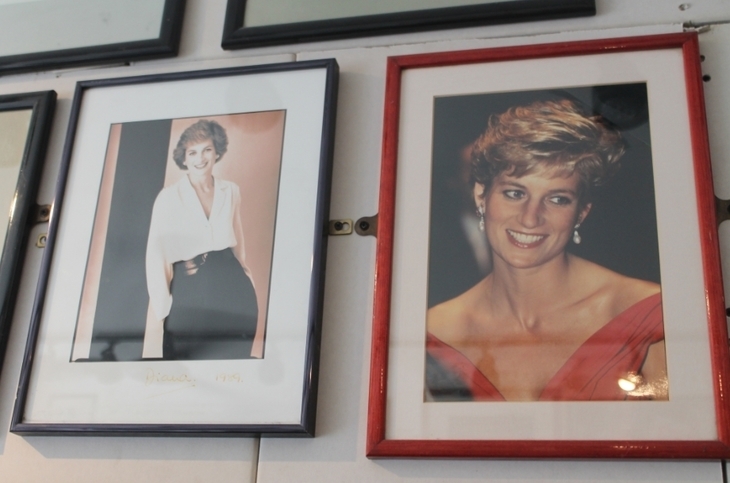 That's when the walls really started filling up with Diana memorabilia. It's no exaggeration to call the cafe a shrine, either — albeit one that serves toasted sandwiches and shish kebab. 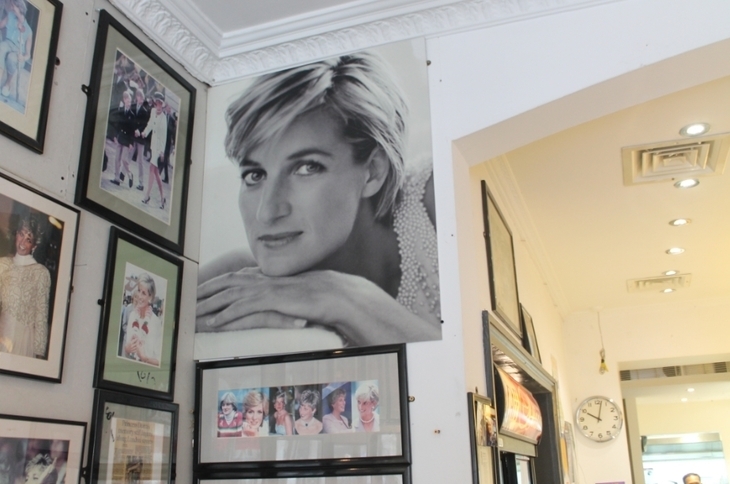 The customers in here this morning — including a girl from Romania who popped in to get an orange juice, and a couple of businessmen wolfing down breakfasts — are indifferent to Diana when asked. But many who come here, do so for Diana, the chance to be near her. 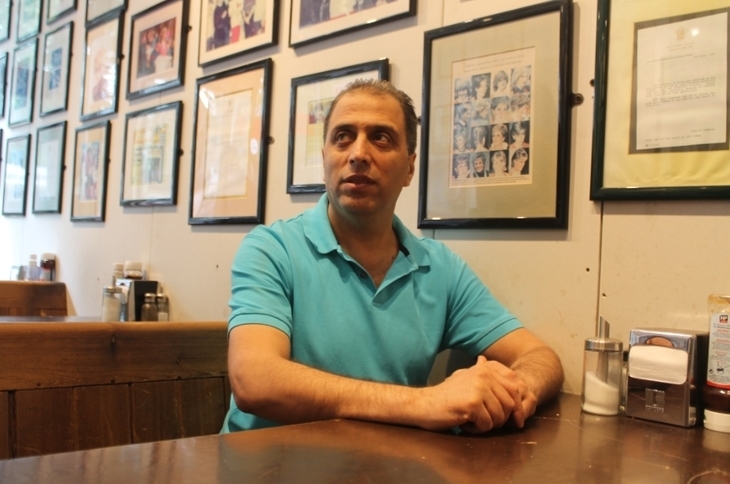 "Americans are completely mad about Princess Diana," says Fouad, "They love her. So you see them come here and look at the pictures. And some of them cry. It's been 20 years now. I've seen women come in here sometimes, they crying: 'Oh we miss her so much'". And what does Fouad think of Diana almost two decades on, still working day in, day out in a room dedicated to her memory? "Diana is like a special person, shy person and she's a normal person," he says. We note how Fouad sometimes speaks about Diana in the present tense, and he admits: "For me sometimes I think she's still alive. I see her more than my family! "You think 'one day she will come in.'" "We're expecting maybe William will come back one day, you never know, bring George in. He could come anytime for a cup of tea, we don't mind. "It'd be on the house."